The Chronicles of Gillean | Site dedicated to an exploration of the science, history, sociopolitical ideologies, and psychological drama of the book…"The Chronicles of Gillean"
You can find books of widely disparate plot, topic, and theme categorized as science fiction. I think this is a reflection of the world as it changes around us. Sci-fi is not a static construct. It’s dynamic. It evolves as we progress along the road of discovery. As such, there are a variety of definitions that attempt to describe the boundaries of a genre that doesn’t want to be contained. Science fiction is standing on the shoulders of giants…of visionaries, of pioneers, of intellectual dreamers, and stretching the fingers of our imaginations across time as far as they can possibly reach, pushing and sliding them simultaneously into the future and the past, and bringing back a story that stimulates minds and touches lives. It’s planting the seeds of what we know and fertilizing it in the soil of the imagination. We could go through a list of the greats, those who have been influential in the literary and entertainment industries, but the list would be exhausting. I think when we stand back and look, it is easy to see they have things in common – they took available facts from chemistry, biology, physics, astronomy, etc., or maybe pulled from the historical record. In their minds they reformulated the information and presented it in a new way, many times taking great leaps in understanding and presenting new visions and new stories. Many have made bold predictions that have eventually come to fruition. In the process writing, science fiction authors create worlds outside our own… worlds that beckon for us to return. What can I say that millions of others haven’t already said or thought. This is an amazing series…the consummate story of good versus evil. I can’t image a literary life without having read J.R.R. Tolkien’s books, starting with The Hobbit and going to the end of The Lord of the Rings trilogy. As wonderful as the movies were/are, I think reading the books was a much deeper experience and should be a part of every person’s library. Looking back on it, I think that one of the things that stuck with me was the plight of Frodo. When I first read it I don’t think that I quite understood what Tolkien was trying to say about the nature of evil as embodied in the ring. Sure, it was obvious that it was evil and that it magnified extreme passions. What I am referring to are the more subtle aspects of what it did to Frodo – how his continued possession of the ring increasingly weighed him down, how in the end it won out even over him, and how afterward his mind was irreparably harmed by the experience. Tolkein was masterful in the way his story drew parallels with our life journey and our frailties as an imperfect species. There are some direct connections with this philosophical/spiritual concept and what is being discovered on a scientific level. What I am referring to is the potentiation of neural pathways in the human brain. Thought processes and deep emotions are directly related to patterns of neural firing in the brian/cerebral cortex. A specific thought process, if repeated over and over again, causes the strengthening, or potentiation, of the corresponding specific pattern of neurons. Over time, the strengthening of these pathways has the potential to indelibly change who you are. Focus on the negative and that in many respects is what you become. These ideas are not new in the study of the neurogenesis of psychoaffective disorders such as depression and anxiety disorders. In a way, in Frodo’s journey is a lesson for all of us – focus on evil, stay in close proximity to it, choose to keep it as company, and it will change who we are, and the damage could potentially be irreparable. The same principle of course goes for the forces of good. There are definite story lines within The Chronicles of Gillean that embody this concept, most poignantly with the main protagonists Jake Gillean and Ben Murray. Certainly can’t think of childhood and the wild influences books have had on my imagination without thinking of Ivanhoe. This story boasts a cast of characters that are memorable and continue to spark imaginations almost 200 years after pen was first put to paper. The cast includes the disowned son – Wilfred, his angry father Cedric, the band of outlaws following Robin of Locksely, King Richard the Lionhearted returning to claim his throne, the beautiful Rowena and Rebecca, and a cast of villains including Prince John, Brian de Bois-Guilbert, Reginald Front-de-Boeuf, and Maurice de Bracy. In the story, set in Twelfth Century England, we see people driven by passions and emotions. Through their trials we can certainly gain an insight into what Sir Walter Scott may have witnessed in the struggles of his day. Through his work it is easy to imagine what he might have said if asked at a dinner party his opinion about the nature of man. He said as much in his work. He portrayed ambitious and ruthless men wrapping themselves in cloaks of clerical righteousness. Those with power and means, the nobility, disenfranchised others of less socially fortunate birth. Even those of lower birth embraced the extreme hatreds and prejudice of the day…in this case anti-semitism. At the same time, there is an opposing force, a force for good fighting valiantly against the negatives humanity has to offer. At its heart – it’s a wonderful old-fashioned tale of good versus evil. You have to read it for yourself to see how it ends. The Book: What is it? 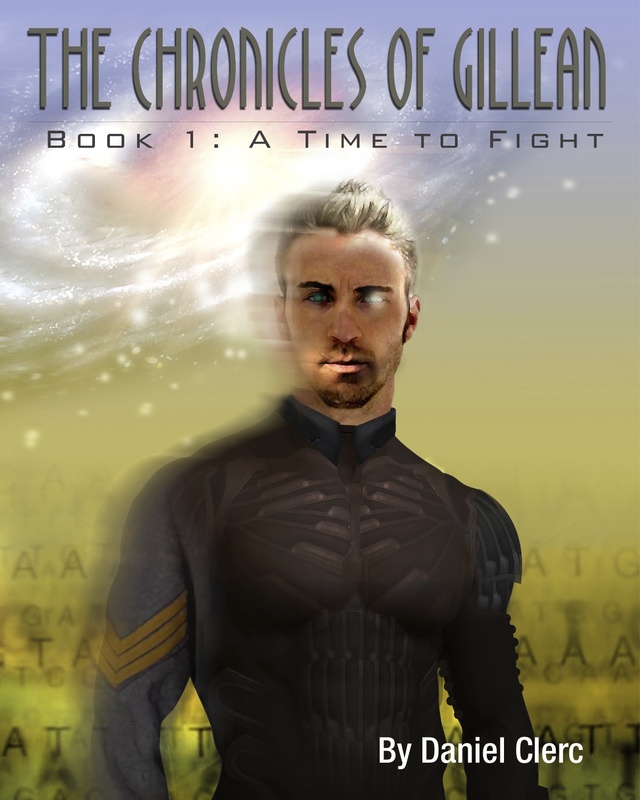 The Chronicles of Gillean is a story with plot lines that are overlapping and interwoven in such a way that when characters and forces collide they do so with absolute fury. The ultimate goal is to provide entertainment. If you can slip into another world for a few hours, if you can climb inside the heads of characters from both the future and the past and find their journey compelling, if you see elements of yourself and the present state of the world buried in the story, if you experience the raw emotions along with the characters, and if you find yourself wanting to know what’s going to happen…then I have accomplished my goal. On another level, buried between the lines is an exploration of many questions. Chronicles pushes but doesn’t answer…you have to come to your own conclusions. What is the fundamental nature of man (meaning male and female)? What is the relationship between man and government? When does a government have too much power? Are some political systems better than others? What is fascism, communism, socialism, and democracy? What exactly is freedom? or liberty? What will advancing science and technology do to society, the military, and life as we know it? What will the weapons of the future look like? How will we harness energy? What happens when the advances of science clash with ethics but advance the interests of the power class? Are there areas where science should not tread? What is free will? What is determinism? Can they co-exist? What exactly is the brain and how does it provide for consciousness, and the conscience? How much of our destiny is predetermined/controlled/dictated by our DNA? Are there lessons to be learned from history? Do people change, or are the conflicts of our time just the same fight happening over and over again? If we understand economics can we better understand and predict world events? How easy, or hard, is it to brainwash an entire society? Is it ever justified? What exactly is patriotism? Is it inseparable from the human condition? Can it be perverted? In the end, The Chronicles of Gillean is about the life of Jake Gillean. Follow him on his journey for redemption…he is a husband and father, a warrior and soldier, a man who earned everything, and then lost everything – including his soul. One thing became painfully clear when I first began writing Chronicles…my training/background up to that point in my life (medicine and science) had left me woefully unprepared for this type of project. Even my love of all thing history and rather healthy reading list was inadequate as most of it was written in narrative form. Compelling first person history is a rather recent development, or at least it has become more popular in recent times. The right side of my brain knew exactly what it wanted to say – the flow and the art form was there, but the left side struggled to let go of anything that wasn’t scientific and brutally narrative in form. Recognizing this I sought help. I read as much as I possibly could, I was reading stories certainly, but also studying the style and creative genius of the authors. I ran my own little clinic. Despite all the personal efforts, books and reading can’t replace the human interaction of an editor (mine is a genius by the name of Diane Mettler). That’s where real training takes place. IT WAS BRUTAL!!! I brooded over her comments and criticisms, drowning my emotions with coffee strong enough to pop eyeballs. “Why can’t she see where I’m going with this?” or “This is a vital part of the story because of something that will happen three chapters later.” or “There’s no other way to do this because the reader needs the background information so everything will make sense.” Each and every time – I WAS WRONG. Don’t tell us what the characters did…show them in action. Let the story show the characters doing things. Don’t be the omnipresent narrator. Read your work out loud. Gaps in the writing become painfully obvious when you do this. In silent reading it’s natural for the brain to fill in the gaps. In other words, they fly under the radar. There has to be drama. There has to be a reason to WANT to turn the page, to read on and continue reading into the next chapters. Conflict builds drama. Reveal the external conflicts between people as well as the inner conflicts that are pulling them apart. Don’t be afraid to show the dark side of a character…even the good ones. This makes it more realistic and interesting. When taking feedback it’s natural to get defensive. A person’s writing is very dear to them…it’s very personal. Don’t allow pride cloud your vision. Let it go and you’ll get better. At the same time…you HAVE to stay true to yourself and your vision. The work has to be yours. It’s okay to have a style…as long as it’s real and not contrived. Language is an art…not a science. It allows for flexibility. But, if your style is contrived it will fall apart and do you a disservice in the end. Have as many people read your work as possible. Their feedback is important. Be careful who you ask. If all you are going to get is a, “It was great,” or “I liked it,” don’t waste your time. You need honest and open feedback. When you get feedback it’s okay to ask questions and clarify…but don’t argue that their perceptions are wrong.